We teach you how to make cheung fun, or rice noodles, at home. Check out our cheung fun recipe and 2 easy, authentic dim sum dishes you can make with them! Combine the rice flour, tapioca starch, wheat starch, and salt in a mixing bowl. Add the canola oil and 1½ cups lukewarm water and whisk until smooth. Whisk in the boiling water. Set aside and allow the batter to rest for 45 minutes. We used an aluminum 10” square cake pan for steaming the rice noodles. You can also use a 9-inch round cake pan and simply adjust the amount of batter per batch. The noodles should be about ⅛” thick, so the batter should just cover the bottom of the pan in an even layer. This homemade noodle may come out a little thicker than what you get with dim sum in restaurants, but you can practice making them thinner! Use a wok or a deep skillet for the steaming, but whatever you use, it must have a lid. Fill your chosen vessel with at least 2 inches of water. The cake pan with the batter in it should be able to float on the surface of the water, and then the entire cooking vessel should be able to be covered. Bring the water to a gentle simmer. Very generously brush the bottom and sides of the cake pan with oil. Place the oiled pan on the simmering water to warm it up. Give your batter a good stir, and then carefully pick up the pan (it’ll be hot), and pour some batter in. Swirl it around quickly so it evenly coats the bottom of the pan. For my 10” square pan, I used a ⅓ cup of batter at a time. (Make sure that you give the batter a good stir each time before using it, because the rice flour and water tends to separate a bit). Once the pan is coated, place it on top of the simmering water, cover the pan, and steam for 3 minutes. Add the sugar and water to a saucepan and heat until all of the sugar is fully dissolved. Add the dark soy sauce and oyster sauce and let simmer very very gently until the sauce is thin but coats the back of a spoon in a translucent layer. Set aside. When your cheung fun batter is ready, you can start making these. In a strainer, rinse the dried shrimp (if using) under running water. Soak them in warm water for 10 minutes. Drain, and roughly chop the shrimp. Set aside. Add oil and chopped shrimp to a small pan over medium heat, and sauté for about 2 minutes. Add the salt and scallions, and stir until combined. Remove from the heat and set aside. If you’re not using the shrimp, simply sauté the scallions with oil and salt for 1 minute, and set aside. Cook your rice noodle according to the instructions above and take the cake pan off the simmering water (if using store bought rice noodle sheets, simply lay the noodle out in a flat layer on a clean surface). Spread 2 tablespoons of the shrimp and scallion mixture all over the surface of the noodle, and sprinkle some toasted sesame seeds over it as well. Use a rubber spatula to carefully part one side of the rice noodle from the pan, and roll it up in a tight cigar. Remove to a cutting board and slice into 1-2 inch pieces with a sharp knife dipped in warm water. Plate and garnish with sesame seeds, scallions, and serve with your dipping sauce. To make this Chinese fried dough rice roll, toast 2 crullers in the oven until crispy (instructions on the package. Usually a few minutes at 350 degrees F will do the trick). Split each cruller in half, since they often come with 2 stuck together. 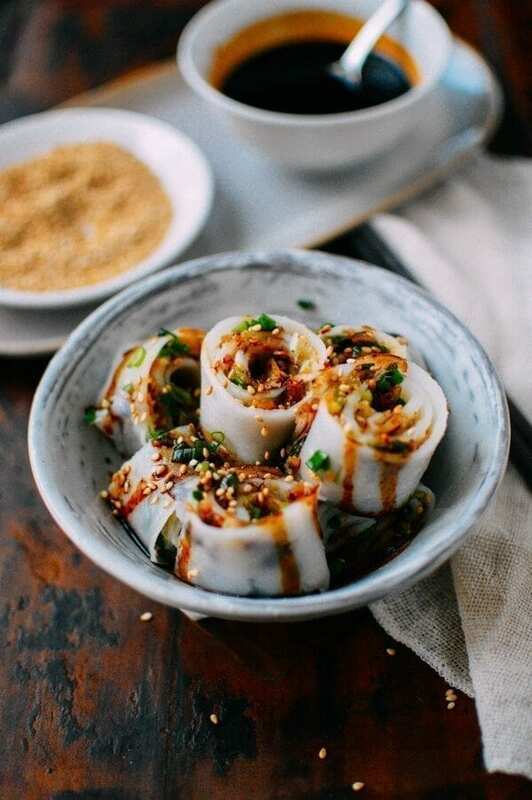 Take your cooked rice noodles, and roll each half of a cruller in a rice noodle sheet. Cut into pieces and serve with your dipping sauce. (Note: the rice noodle I used for the cruller in these pictures was a little bit too thick, but you can adjust the thickness with practice and to your own personal preferences).